Find exceptional family practice doctors at North Shore Medical Center. North Shore Medical Center (NSMC) is a Boston area hospital and the largest healthcare provider on the North Shore. Our many exceptional family practice doctors provide primary care to North Shore families and individuals, from infants to seniors. Your family doctor manages the health of your family, so it's important to pick a practice that works for you. Our North Shore Physicians Group family physicians and our private practice family physicians are happy to schedule a preliminary appointment to meet you and answer your questions. Family practice doctors provide comprehensive care for the whole family. Family practice doctors provide annual checkups, vaccinations, and screenings, and are able to diagnose a broad range of medical conditions. Family medicine specialists are able to provide referrals to other specialists as needed. Patients are typically referred to specialists at NSMC Salem Hospital, NSMC Union Hospital, and MassGeneral for Children at North Shore Medical Center, or to specialists at the Mass General/North Shore Center for Outpatient Care in Danvers. Through our membership in Partners HealthCare, NSMC patients may also be referred to specialists at Massachusetts General Hospital or Brigham and Women's Hospital in Boston. Connect with family practice doctors through Patient Gateway. Make routine appointments with family doctors. Receive email reminders about future appointments. Research information about health and disease. Get directions to the practice and other helpful information. Patient Gateway also provides patients with access to their online medical record, including information about medications, allergies and lab results. This electronic medical record can help improve care by streamlining communication between patients, family practice doctors and hospitals. 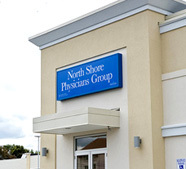 NSMC family practice doctors are physicians of the North Shore with offices in Beverly, Danvers, Salem, Peabody, Lynn, Marblehead, Saugus, and Swampscott. Many offer extended night and weekend hours. To find a family practice doctor close to you, visit NSMC's Find a Doctor. Or call 877-676-2637 to find the right practice today.